POSTED: Mon, 08/15/2016 - 11:00 | POSTED BY: Traci C.
As Disney fans, we probably all have a list of things to do, places to eat, menu items we want to eat, and even hotels we must stay in at some point in our travels to the Walt Disney World Resort. It might come as no surprise to anyone that I have a Disney dining bucket list. What is on your Disney Dining Bucket List? My "dining bucket list" is full of things I want to eat (again) and things I want to eat for the first time, and restaurants where I want to dine in at some point in time. I started making this list a few years ago after I came back from Disney World and realized that I had forgotten (gasp!) to get a Dole Whip float on my visit. This is by no means a complete list, but even I have a word limit. 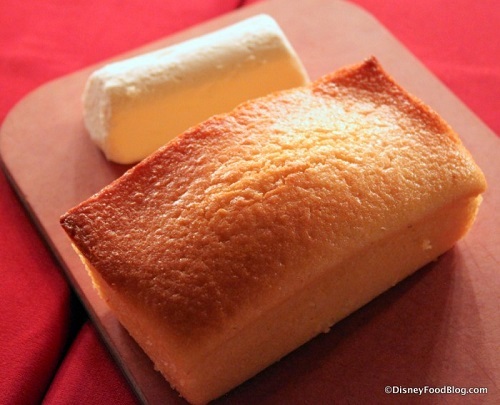 ;-) So without further ado, let's check out the top 10 on my Disney dining bucket list. 10. Any of the food or beverage 'crawls' from the Disney Food Blog Guides: If you have ever read any of the DFB Guides you'll find fun food and beverage crawls in the back of the books. They're a fun way to experience some of the best foods and drinks at the theme parks and resorts. A few I'd like to try are the "Resort Eats Crawl," the "Milkshake Crawl," and the "Food and Wine Classics Crawl" for the Epcot Food and Wine Festival. 9. The BOATHOUSE: This signature dining restaurant opened in 2015 and is home to some rather pricey food served in a beautiful nautical-themed setting. Of course, the food is why this restaurant is on my bucket list. I love seafood and can't wait to splurge a little. I suppose I could stop by the Raw Bar and enjoy some oysters and a nice cocktail, but I say go big or go home. So my bucket list item is dining at the restaurant (I'm thinking steak and seafood!) and ending the meal with the Gibsons S'mores Baked Alaska! That is what I call 'dessert'! 8. Hoop Dee Doo Revue: In all the years I've been visiting Walt Disney World I can't imagine how I missed making an Advance Dining Reservation for this dinner show at Fort Wilderness. But that's why it is on my bucket list. The Revue has been around for more than 40 years and it's a must-do for many guests. The Hoop Dee Doo Musical Revue features a fun show and all-you-can-eat fried chicken, ribs, sides, cornbread, and the almost-world-famous Strawberry Shortcake for dessert. Sign me up! 7. Jiko: This is another signature dining restaurant that I haven't managed to dine at in all my travels. (At this point I'm blaming my kids for my lack of signature dining...and I'm only partially joking). You'll find Jiko at Disney's Animal Kingdom Lodge and even though I'd love to dine here with just my husband, I really do want to take the kids as they're old enough to appreciate the menu now. 6. Trader Sam's Grog Grotto: Located at Disney's Polynesian Village Resort, this tiki bar is at the top of my must-visit-watering-holes at Disney World. I'm gonna need to find a few friends to go with me as the one drink I MUST have is the Uh-Oa and there's room for 4 straws! 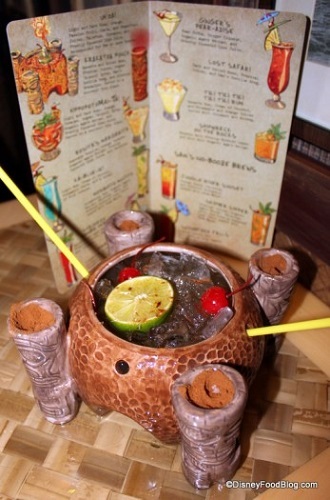 The Uh-Oa description says: "Only the brave should sip from this flaming concoction. The Tiki goddess of disaster looks down upon those who guzzle in the Grotto." Sounds like the perfect night out to me! 5. Morimoto Asia: Ever since this signature restaurant opened in 2015 I've been dying to visit. I love sushi (and Chef Masaharu Morimoto). Plus, have you seen the photos of the dining room? Gorgeous doesn't even begin to describe it. 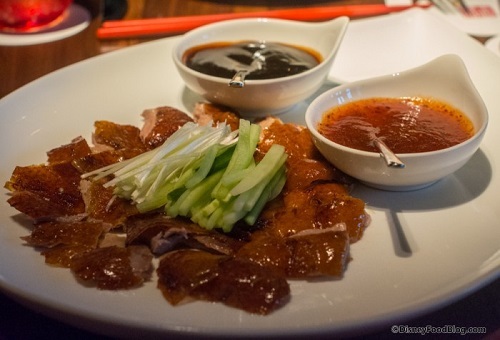 I've already decided that when I make it to Morimoto Asia I'm going to order Sake Sangria (and hope my dining companions will drink it with me), Morimoto Peking Duck, and a couple sushi rolls. Who's with me? 4. The Kitchen Sink: OK, so this item isn't a must-visit place but a must-order ice cream sundae. I've never ordered a Kitchen Sink Sundae and one of these days I HAVE TO DO IT. 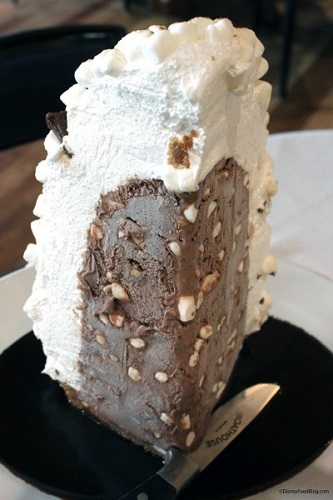 The next time I'm visiting Beaches and Cream with friends we are definitely getting this mammoth sundae. 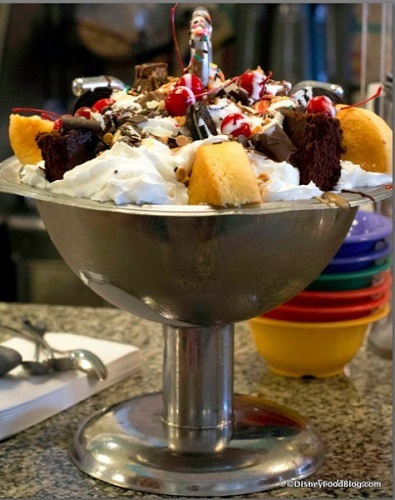 The Kitchen Sink serves four (or more) and includes vanilla, chocolate, coffee, strawberry, and mint chocolate chip ice cream topped with EVERY topping at Beaches and Cream. And yes, it is served in a kitchen sink. 3. California Grill: Next year my husband and I are celebrating our 15th wedding anniversary and I think dining at California Grill at Disney's Contemporary Resort might be a wonderful way to celebrate. This signature dining restaurant is home to an impressive wine collection, the must-try Sonoma Goat Cheese Ravioli, sushi (yes! ), and amazing entrees (I think I'd like to try them all). Of course, it's best to make your ADR for twilight so you can venture out to the outdoor viewing area to watch Wishes from the Magic Kingdom. 2. 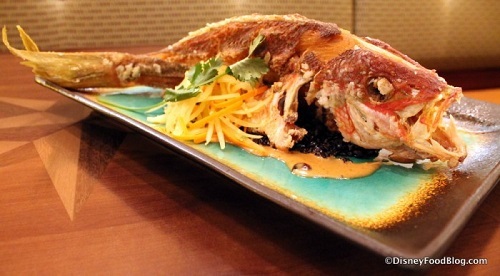 Tiffins: There is one reason I have this new signature dining spot on my dining bucket list: sustainable whole fish. Yep. That's right. I want to dine at Tiffins in Disney's Animal Kingdom so I can order the Whole Fried Sustainable Fish. I loved ordering the whole fish at Kouzzina's by Cat Cora and I really can't wait to try it at Tiffins. Yes, the fish is slightly terrifying to look at, but that's part of the fun. Right? 1. Victoria & Albert's: Is it safe to say that this is the ultimate Disney dining bucket list item? Yes, probably. This signature dining restaurant is one of the most critically-acclaimed restaurants in Florida and is consistently ranked as a AAA five-diamond restaurant. I think I'll make this my 50th birthday destination (which gives me seven more years to plan!) At Victoria & Albert's diner can make reservations for the dining room, Queen Victoria Room, or the ultra-exclusive Chef's Table (one seating per night for parties of one to 10). This is the pinnacle of fine dining at Walt Disney World and will remain my number one bucket list item (at least until I can check it off). 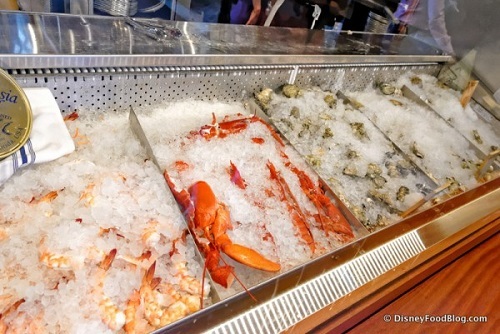 What is on your Disney dining bucket list? We'd love to hear about where you can't wait to dine or what items you have to try on your next visit. Leave us a comment and share your thoughts. 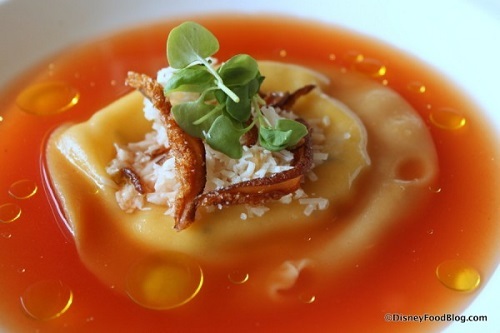 Many thanks to the Disney Food Blog for use of their photos. 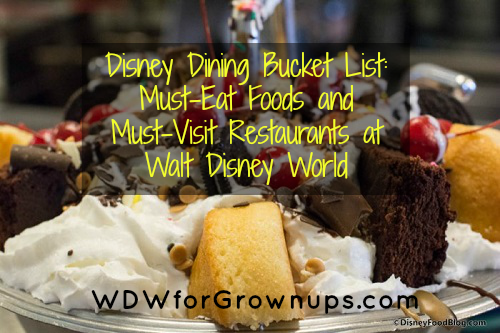 Make sure you check out the DFB's #OnTheList Disney Food Bucket List. On My bucket list for September is the Carnitas at Frontera Cocina, Fried Chicken at Homecoming Florida Kitchen, and the Pecan Pie at both of them! I hope to do the California Grill, Flying Fish and Narcoosee's. However, they all have dress codes, and when I'm at WDW I dress like a slob: cutoffs, t-shirts and tennis shoes. But we just did Morimoto's and Tiffin's this past trip. They are well worth the $150+ price! Experimentaremos en tiffins en diciembre. Espero nos guste.